In China the 4 cardinal points of the compass are related to ‘4 Celestial Animals’. These are: the dragon of the east, the tiger of the west, the phoenix of the south and the tortoise of the north. In contrast to the dynamic qualities of the first three of these creatures, the humble tortoise is an animal that could easily go unnoticed, yet it is rich in symbolism, not just in China, but also across many lands. Numerous cross-cultural correlations can be seen to occur within this symbolism as we cross the globe. The tortoise has frequently been associated with the art of divination and is often credited with bringing to us the trigrams of the I Ching and also the idea of the Lo Shu magic square, which is much used in Feng Shui as well as in mystic sciences and sacred geometry throughout the world. In Chinese symbolism the tortoise represents the beginning of creation, time, longevity and wisdom. It is said that the Goddess of Creation – Nu Kua used the feet of the Cosmic Tortoise for the ‘4 Corners of the Earth’ and its shell for the ‘Vault of the Heavens’. Rarely is a distinction made between the tortoise and the turtle and together they are associated with the element of water, the season of winter and the direction of north – the direction of death / rebirth. The ability to slow down its body metabolism (apparently dying), during winter hibernation, and then awake renewed, reflect the death /rebirth association. The tortoise is sometimes known as the ‘Dark Warrior’ and in this role its qualities are seen as strength, endurance and regeneration. Its inanimate shell represents the lifeless rock that is acted upon by the elements of nature and by divine inspiration (the breath of the heavens) to produce life. This scenario is dramatised in the novel ‘A Journey to the West’ where Monkey (and by analogy humanity), is born as the Stone Monkey, from an egg shaped rock. Thus born into the light, he must become a warrior and encounter his dark or shadow side. 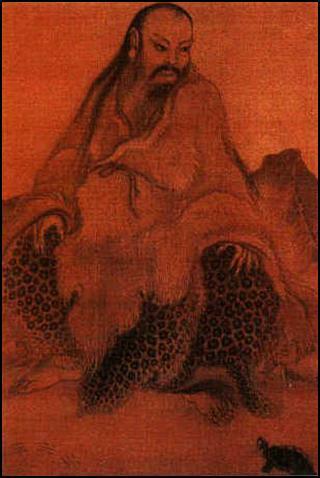 Another Chinese legend tells of how a family were trapped within a cave and were able to survive for many hundreds of years (yes - hundreds), by observing and copying a tortoise that was trapped in the cave with them. The earliest Chinese written characters are to be found carved on tortoise shells. 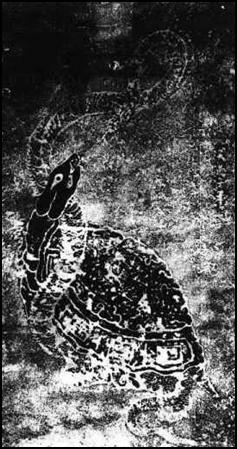 Chinese artwork will sometimes show a snake and tortoise entwined and it is said that their coupling engendered the universe. Other artworks show a tortoise with a crane, and when these two animals are together it is specifically a symbol that emphasises longevity. Tortoise entwined with a snake. Stone rubbing after Wu Tao-Tzu, the great Buddhist painter of the T’ang dynasty. In Japanese mythology, the tortoise is support to the ‘Abode of the Immortals’ and for the ‘Cosmic Mountain’, where the Cosmic Mountain relates to the axis mundi – the world axis. In Indian mythology, the tortoise is said to be the first living creature – the progenitor, and is equated with the Pole Star, which is, by its alignment, related to the earth’s axis. The flat lower shell of the tortoise is the plane of the terrestrial world and its’ rounded upper shell is the celestial world (the canopy of the sky). The tortoise is depicted supporting the elephant on whose back the world rests. The elephant is male, the tortoise female, so representing the two creative powers of ida and pingala (or yin and yang). Symbolically the retraction of the tortoises head into its shell is regarded as a conscious turning inward as in meditation and therefore showing an advanced spiritual state. One of the incarnations of the central deity, Vishnu (the Preserver), was as a tortoise – the progenitor of all living creatures. Vishnu in his incarnation as a tortoise—supporting the world axis, around which is entwined the cosmic serpent with deities and demons pulling at each end. 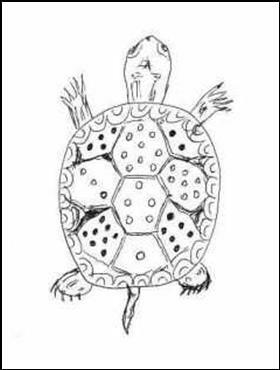 In American Indian teachings the turtle is the oldest symbol for the planet Earth. It represents the goddess and the eternal Earth Mother from which we are all born, our lives evolve, and to which we will return. Turtle Island is the name given to North America by many such First Nation People. In classical mythology the tortoise is sacred to both Aphrodite (Venus) and Hermes (Mercury), two deities associated with sexuality. It has been suggested that one reason for this association may be the action of the tortoises head as it extends and retreats from its shell. Here again we see a connection with procreation. Aesop, the Greek slave famous for his fables, tells us that the tortoise got its shell after declining an invitation from Zeus, with the excuse that, “There’s no place like home”. The response angered Zeus so much that he made the tortoise forever carry around his home. Despite this handicap, in another well-known fable, the tortoise is victorious in a race with a hare, proving that slow and steady can arrive first. A contemporary of Aesop (around 500BC) was the philosopher Zeno who delighted in paradoxes. Perhaps the most famous of these was to mathematically prove that in a race between Achilles and a tortoise, where the tortoise was given a short start, Achilles would never be able to catch up to it. He used a similar mathematical proof to show that an arrow fired at a target can never arrive there, (for more on this, see Zeno and the Tortoise by Nicholas Fearn). His paradoxes raised ‘modern’ problems of time and space that have fascinated mathematicians and philosophers ever since. Another Greek philosopher and mathematician was Pythagoras who said that, “All things are numbers”. We shall see further connections between the tortoise and numbers as we look into the tortoise’s associations with oracular systems and geomantic arts. The Yoruba of Africa developed a divination system called Ifa that used tortoise shells as an oracle. This association of the tortoise with oracular powers is in fact quite widespread. The I Ching has claims to being the oldest book in the world. It most likely evolved from an even more ancient divining system known as the Tortoise Oracle. One early method of divination was to heat animal bones in a fire and study the cracks that appeared; another method was to interpret the markings on tortoise shells. Such methods were probably employed to consult about affairs of state, fortunes of war, proposed marriages etc. We are told that around 3000 BC, the Emperor Fu-hsi (Fu-xi) was meditating by the Yellow River, when a tortoise emerged from the water and the markings on its shell revealed to him the trigrams of the I Ching. The 8 trigrams were later paired to produce a more sophisticated system with 64 hexagrams. Stories say that in 1143 BC, whilst imprisoned, King Wen systematically organised these hexagrams into a cohesive system that included a commentary and this has given the structure of the I Ching that we know today. Around 1000 BC, yarrow stalks were being used in place of tortoises, making divination much more accessible and widely available and perhaps meaning that tortoises could now sleep a little easier. It is further suggested that around 500 BC, Confucius may have added further commentaries to the I Ching and to him are attributed the words, “If I could add years to my life, I would dedicate them to a study of the I Ching”. The I Ching can thus be said to be a philosophical system based on higher mathematics. 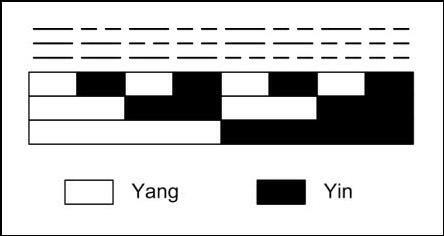 It utilises strong / solid lines that are considered to be yang, and yielding / broken lines that are considered to be yin. Shao Yung (AD 1011 – 1077) drew a pictorial representation of how the trigrams emerged from the original yin yang split and how this produced their order in the ‘Earlier Heaven’ or ‘Primal’ arrangements. 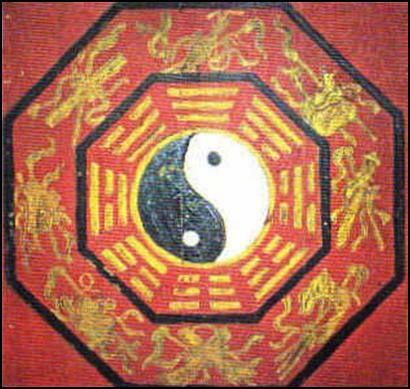 The 8 possible trigrams were then arranged in an octagonal form known as the Pa Kua and are often placed around a yin yang symbol in either an ‘Earlier Heaven’ configuration (as shown here), or in a sequence of ‘Later Heaven’. These 8 trigrams are the building blocks of 64 hexagrams that display every possible combination of these lines. As with the trigrams, the 64 hexagrams are usually laid out in either an ‘Earlier Heaven’ (Fu-hsi) sequence or a ‘Later Heaven’ (King Wen) sequence. It was the first of these sequences that led the 17th century father of calculus, Gottfried Wilhelm Leibniz to discover the functioning of the binary system. A Jesuit priest, who was based in China, showed the configuration to Leibniz, who investigated further and discovered that if the value of 0 were attributed to each solid line, and the value of 1 to each broken line, it would give the binary notation for the numbers 0 through to 63. The uncovering of the binary code allowed Leibniz to change the path of mathematics for all time. The I Ching is therefore the earliest known example of binary notation, this being the smallest complete arithmetic number system as well as the language that enables computers to work. 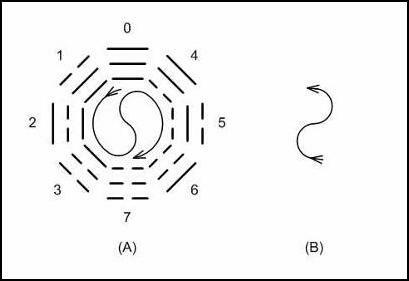 This layout of the 64 hexagrams could not have been mere chance and describing the discovery of these diagrams, Cyrille Javary considered it to be, “An invention in the same sense that Newton invented gravity” - in other words - a discovery of something implicit in the cosmic order. The lines are cast from the bottom upwards and when in a circle they are read from the centre outwards. Following the order of the trigrams around the yin yang shape as indicated in Diagram (A) will; when they are laid out in a row, give the order shown below. The cycle then continues by following round the curve of the reversed yin-yang as in Diagram (B) to make an infinity loop. Using the binary or ‘base two’ notation that we mentioned before where ------ = 0 and -- -- =1, it can be seen that the trigrams give the numbers 0 to 7 in ascending order. The I Ching began to gain some recognition in the West from the 1920’s when Carl Jung began to look into this ancient Chinese oracle as a means of bringing to consciousness that which is buried in our unconscious and as a tool to study synchronistic relationships. Still more recent research has uncovered amazing similarities between the I Ching and the structure of DNA, the thread like material in living cells that is the genetic code, which determines everything about us. It is a spiral molecule in the form of a double helix made of 2 times 4 chemical bases that form 8 times 8 - i.e. 64 ‘codons’ or genetic ‘words’. Maybe the ancient Chinese sages knew intuitively about the code of life. He observed a 3 by 3 grid where the number of marks in each line and diagonal totalled 15. Because he was by the River Lo, this became known as the Lo Shu – the Lo River Diagram. Legend says that Yu the Great lived in the twenty-third century BC and that he quelled the Great Flood of Chinese mythology. He also set the rivers on their right courses and divided China into 9 provinces. A Taoist ritual and sometimes a Ba Gua training method, is to move in a pattern that follows the ‘magic line’ of the 3 by 3 square as shown in the diagram. This is known as the ‘Paces of Yu’ and is said to simulate the course Yu took on his travels through the 9 provinces whilst quelling the flood. The Lo Shu square is seen as a harmonious blend of the 9 archetypal principles of number and as giving a cosmological plan of time and space that reflects the supreme order of the universe, no less. Such importance was laid on this configuration, that it was used as the ground plan for the nine palaces of the Emperor. As the intermediary between heaven and earth, he mirrored this cosmic plan by living and circulating around these palaces during the year. The plan was extended to the design of the capital city itself, with Old Peking at the centre and having eight avenues of access - symbolically the centre of the Middle Kingdom of the world. Today the square plays an intrinsic part in the geomantic art of Feng Shui. This same square has been discovered by many cultures and is often referred to as a Magic Square. In India this 3 by 3 grid is sometimes extended to 9 by 9 and used in the ground plan of temples dedicated to Vishnu, the Preserver. Each of the 81 cells is dedicated to a different aspect of the deity. 5 by 5, 6 by 6, 7 by 7, 8 by 8 and 9 by 9), are associated with the 7 visible heavenly bodies (i.e. Saturn, Jupiter, Mars, Sun, Venus, Mercury and the Moon respectively). This order of association results from the time it takes each of them to orbit through the fixed stars of the zodiac. In both East and West, odd numbers are considered to be active or yang and even numbers due to their stability are passive and yin. Within the square we can see that the even numbers hold the 4 corners in balance whilst the odd numbers are at the 4 cardinal points with the middle number in the sequence (5), holding the centre ground. 5 multiplied by 3 (the number of rows / columns) gives 15, which is the total of each row, column and diagonal. 5 multiplied by 9 (the highest number in the square) gives 45, which is the total obtained by adding all the numbers together. 5 is the mean between the numbers on each side of it (e.g. 4 & 6, 3 & 7 etc). This Lo Shu arrangement brings us back to the 4 Celestial Animals, for the square is orientated in relation to the compass where each direction has its season, element and celestial animal. In the earlier drawing, the lowest number (1) is at the tail of the tortoise, this is the past, the north and winter when it was barely alive. The next odd number (3) is the rising dragon of spring in the East. The highest number (9) is at the head of the tortoise as it looks to the south, summer and the phoenix flying towards the sun at its zenith. 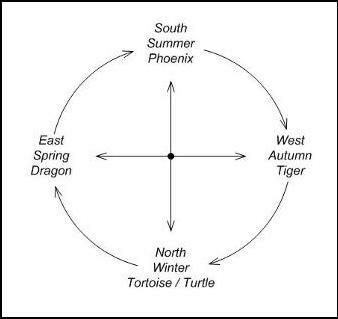 The final cardinal direction is in the West (7), the ‘gateway to death’, with the sun setting in the fall and the decline and decay of the physical as represented by the tiger. And so this cycle of change continues back to the north. 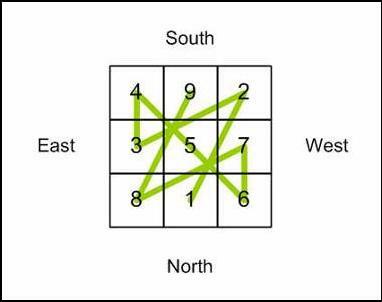 The 8 trigams of the I Ching are related to the 8 perimeter grids of the Lo Shu Square and are considered to reveal its outer meaning, whilst the 9th point, the centre of balance and rotation conceals its inner meaning (in the case of the I Ching the centre contains the Tai Chi symbol). Many esoteric traditions believe that numbers symbolise divine order, cosmic harmony and that they reveal the laws of space and time. In both the I Ching and the Lo Shu, we can see ancient yet highly sophisticated and profound ways of working with numbers to look at the functioning of nature. The stories of tortoises emerging from the waters whilst sages are meditating can be viewed symbolically. As we have seen, the tortoise represents wisdom and here this wisdom arises from the deep unconscious levels of the mind that may be accessed through regular meditation. Their appearance from the water is symbolic of the arising of inspiration and illumination through subconscious levels to become manifest in the world. The Chinese ‘Four Celestial Animals’ have associations with various weapons. The protective shell of the tortoise leads it to be symbolically linked with the shield and its predominantly defensive characteristics. In heraldry the tortoise symbolises protection and invulnerability to attack. In warfare the Romans used their shields to create tortoise like formations where the entire group could be enclosed within a ‘dome of shields’, which could then move as one unit. So, the tortoise, which at first appears as the most lowly of the ‘4 Celestial Animals’, turns out to be of universal significance and the foundation on which the cycle of creation – birth, life, death and rebirth – is built. Fu-hsi (Fu-xi) legendary first Emperor of China. 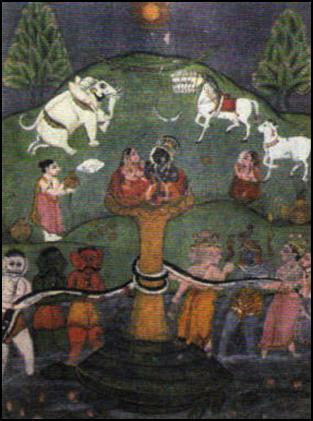 Note tortoise in lower right of picture and trigrams in lower right corner.